Rider Level: Beginners, Intermediate, Expert. Summary: Jungle Habitat opened during the summer of 1972 as a safari theme park created by Warner Bros. and closed in the fall of 1976. After closure the park was left to deteriorate and rumors swirled that park animals still roamed the grounds, which were false, but earned the abandoned park a publication in Weird NJ Magazine. 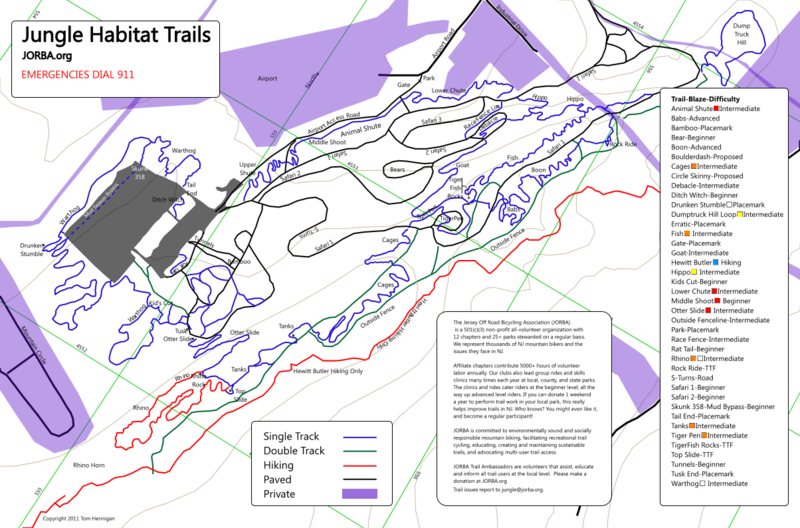 In 2007, local cycling organizations including Ramapo Valley Cycling Club and Jersey Off Road Bicycling Association (JORBA) conducted a large scale park clean up and built an impressive 12 miles of single track trails by 2008. To learn more about Jungle Habitat visit these great organizations below!